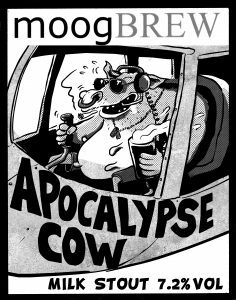 When he’s not flying his copter over a local war zone, there’s nothing Apocalypse Cow enjoys more than kicking back with a few pals and the 7.2% ABV Milk Stout that bears his name. As a cross dressing ex member of the SBS (Special Bull Service) no one would argue with him when he says that it is rich, dark and roasty, yet smooth and slightly sweet. “Much much better than the smell of napalm any morning, noon or night.” He always jokes.